Wooden Tracks Trivet and Coasters Gift Set is Made in the USA! 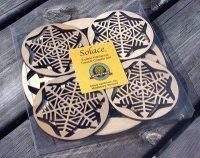 Using our track designs this gift set has four coasters and one trivet. Laser cut from hard wood. Natural maple color with clear finish. Coasters measure 3-3/4" diameter, 1/4" thick. Trivet measures 7-3/4" diameter, 3/8" thick. Packaged in clear plastic box.